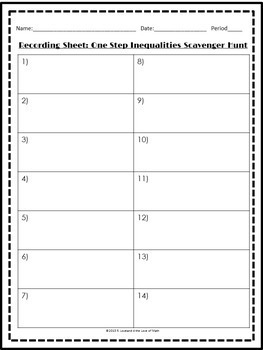 This 1-step inequalities activity includes: 7 pages of solving one step inequality questions (14 questions), student recording sheet, and an answer key. 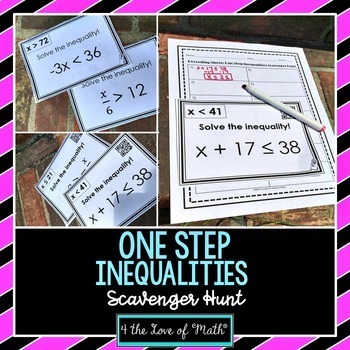 Students will move around the classroom finding the answer that matches their inequalities. 1) Cut each question page in half to separate the question boxes. You will have 14 questions. 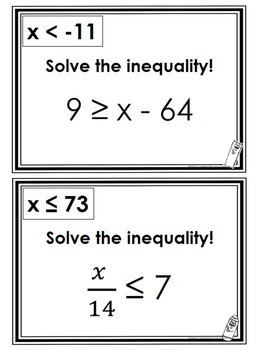 Each question asks students to solve the two-step inequality. 2) Hang the 14 questions around the classroom. Tip: Hang them in a random order, not in the order they are placed in this document. The more random the positioning, the more students will move around! 3) Make enough copies of the recording sheets for each student or each group of students. 4) Divide students up into groups of 2-3 students. 5) Cut out the sheet of answers. Give each group one of the answers (you can put them in a hat and let each group draw on out, or you can just hand them out). The number tells them where to start. Numbers are on the upper left hand side of each question box. 6) Each group of students will begin at their assigned spot. They will work together to solve the problem on the card, and record their answers on the recording sheet. Once they have solved their first problem, they will go to the card that has the answer to the problem they just solved on it. They will continue moving around the classroom answer questions until they have completed all 14 and have made it back to the question they originally started with. Please check out the free preview file to get a better idea of how this activity works! There are 2 sets of scavenger hunt cards. 1 has QR codes, one does not. The set that has QR codes has a code in the upper right hand corner of each card. 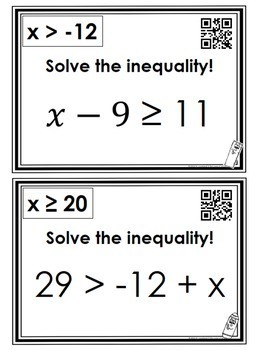 When scanned they will tell students the answer to the question so students can check their answer and make sure they move on to the correct problem! QR code scanners can be downloaded for free onto apple products (like IPhones, IPods, IPads, and many smart phones. I use the app “scan life” that is available in the google store for android phones.